Alchemy's Bindrune Hammer pendant, the head of which is chased with three powerful bind-runes. Made up of: FEOH for wealth and energy and UR for power and courage. Made up of: TYR for war, justice and male sexuality and PEURTH for chance, skill and sexual pleasure. The runes cannot be separated from the mythology of the people who created them. 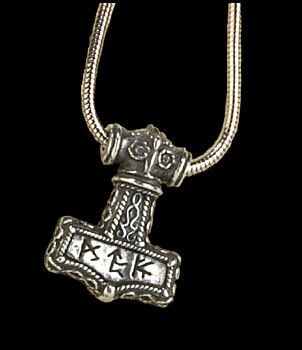 The hammer was the sign of Thor, the god of weather and Vikings wore silver hammers for strength. Cattle: a measure of movable wealth; money; energy and hard work that leads to wealth; emotional and spiritual riches, The rune of Prey, the god of fertility and richness. Auroch (bull): physical strength, endurance, courage; the raw, wild power of freedom; emotional and spiritual strength; male sexual potency; good health; a possible challenge leading to a major life change. The ford of God: controlled, creative, and divine power; spiritual prophecy and revelation; wisdom, knowledge, reason, and communication; instruction and advice; a possible test. Thorn: energy, used for good or for chaos; the forces of the unconscious, anger and lust; a weapon for harm or protection; a spell of luck, or luck running out. Wheel: the wheel of life; travel or movement; direction, planning, foresight, determination, and fortitude; a journey of life or spirituality; communication; wise counsel. Hearth-Fire: light, vision and warmth: natural, robust good health; sheds light and dispels ignorance; spiritual illumination; suggests the way forward; light and action create new ideas. Gift: A gift binds together a giver and a receiver and requires reciprocation; partnership or union, in business or in love; bonding and mutual support and affection. Reward: a feeling of goodness, joy and satisfaction; total harmony with life; passive achievement; cooperation and companionship with others; intimate closeness to the creator. Storm: elemental disruption; linked with other runes, it can suggest changing direction, limitation, interruption, delay; possible hardship, suffering, injury or illness. Adversity: being in need and hardship; perseverance, endurance, inner strength; experience and learning of patience; warns against taking a risky decisions. Has a delaying influence on other runes. Ice: beautiful and dangerous; slippery or brittle; caution for a delay; cools a confrontation; protection; cooling of emotional affection; has a freezing, delaying or preserving influence on other runes. Yew Tree: evergreen; linked with death; regeneration and reincarnation; continuity, endurance; strength, flexibility and long-life; contains protective magic. Gaming Dice: chance and skill, making the best of your fate; disclosure of spiritual secrets; enjoyment of sexuality; wise judgement and moderation needed in applying this reading. Elk Antlers: a favourable rune; powerful protection; reaching up to the divine; success through endeavour in ambition and perseverance. Victory: a positive force from the natural power of the sun; clear vision; victory of light over darkness, good over evil. Tyr, the Norse God: the god of justice and war, fair law and regulation; success through sacrifice; controlling chaotic forces; determination and male sexuality. Regeneration: renewal, purification, healing and recovery; the family and the home; enjoyment in sexual relations; success in fertility and birth, either physically or symbolically and in ideas. Man (species); shared human nature within each individual, from life into death; creativity, intelligence, forward planning, and speech; cooperation between individuals for the benefit of the common good. Water: the life force and a constant danger; the journey through life containing risks; fluidity, mutability, and a lack of control; the sensual madness of sexuality, the unconscious, intuition, and psychic abilities. Completion: fertility god; the certainty of a conclusion; the male orgasmic force, or birth; wholesome sexuality; a strong, affectionate family, and a safe, secure hearth and home; protection; spiritual aspiration. Day: light and life. the new light of dawn, and the strength of the sun at midday and midsummer; the divine light; brightness, growth, progress, development, and sometimes fundamental change. The Ancestral Home: property, fixed wealth or inheritance; inherited family characteristics; a united family's strength; your lifetime's accumulation; your spiritual home. Bosch, Hieronymus: Early Netherlandish painter, active during the fifteenth and sixteenth centuries. His works often focused on strongly moral and religious notions, and the most famous include The Garden of Earthly Delights; a triptych depicting Eden, the earthly delights themselves, and Hell. Byzantine: Of Byzantium or the Eastern Roman Empire. The highly decorated style of art and architecture developed in the Eastern or Greek Empire during the period AD330 to 1453, from which much of the European gothic style derived. 'Caput Mortem': (Latin); 'Deaths head'. 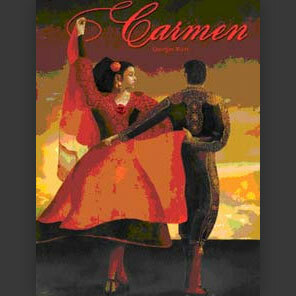 Carmen: The tragic heroine of Georges Bizet’s famous opera. A beautiful, tempestuous gypsy who predicted her own death through card readings; her flirtatious and devious nature led to her eventual downfall at the hands of her scorned lover. Carpe Noctem: (Latin); ‘Seize the Night’. Cartouche: An oval shaped frame containing Egyptian hieroglyphs. 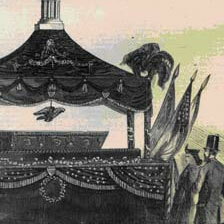 Catafalque: Originating from the Italian catafalco, or ‘scaffolding’. A raised platform, used to support the newly-filled coffins or caskets of the recently deceased during their funereal ceremonies.